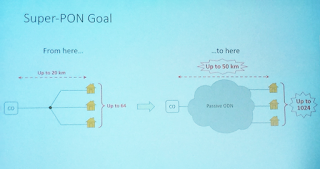 Google is working on a "Super PON" architecture that could improve the economics of fiber-to-the-home deployments, said Claudio DeSanti, Architect at Google Fiber, speaking last week at ADTRAN's Broadband Business Solutions event in Huntsville, Alabama. 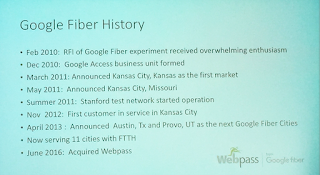 Google's foray into last mile fiber access networks dates back to 2010 when it announced plans to challenge the incumbent telcos and MSOs in the U.S. with a Google-branded and delivered gigabit broadband and TV service. Google Access picked Kansas City for its first deployment and opened a public comment process to identify future rollout locations. Nearly 1,100 communities across the country expressed interest in participating in the Google project and nearly 200,000 individuals submitted comments. Then, in October 2016, the Google Fiber project officially hit the pause button. Craig Barratt, who was CEO of Access, stepped down. The said it would continue rolling out in the cities in it was already present, but that is was pausing operations and laying off workers in many cities where it had once anticipated deploying an FTTH network. Google said its effort had spurred AT&T and others to get serious about FTTH, while holding out the possibility of reentering the market if and when new technology options became available. De Santi said the major lessons learned from this undertaking were that building infrastructure is complex, especially the lengthy permitting process that varies from city to city, and that last mile construction and outside plant costs represent the bulk of spending, mostly because of labor. Google found aerial FTTH to be prohibitively expensive due to policy restrictions of pole sharing with utility companies. Regarding future rollouts, DeSanti said Google is now taking a more practical perspective on running the business for profit and sustainability. 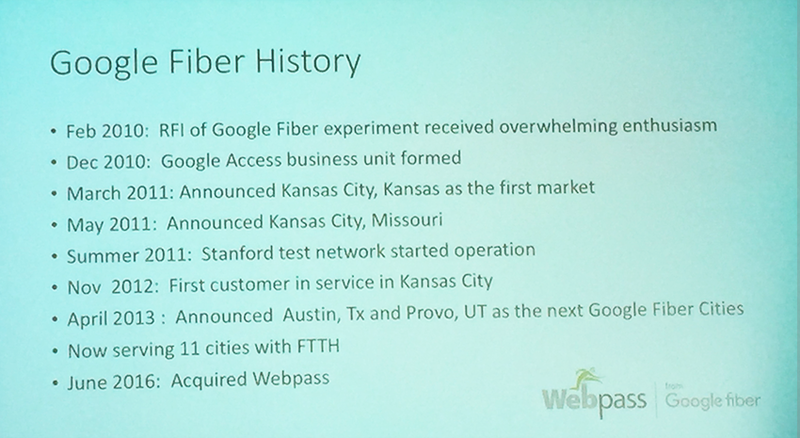 In February 2018, Dinesh (Dinni) Jain ws been appointed CEO of Access, the new name for the Google Fiber and Webpass business. Jain most recently served as Chief Operating Officer of Time Warner Cable. DeSanti said the Super-PON architecture that his team is developing could be a game changer for several reasons. First, it targets a 50 km reach from the Central Office to the subscriber, rather than the 20km target of the current technology. The longer reach is achieved with amplification. This means a larger serving area per CO, and few COs needed to cover a whole city. For a mid-sized U.S. metropolitan area, the current PON architecture requires Google to operate 16 COs. The Super PON might need as few as 3 COs to do the same job. These CO could also be CDN distribution points. No active equipment is deployed outside the CO. 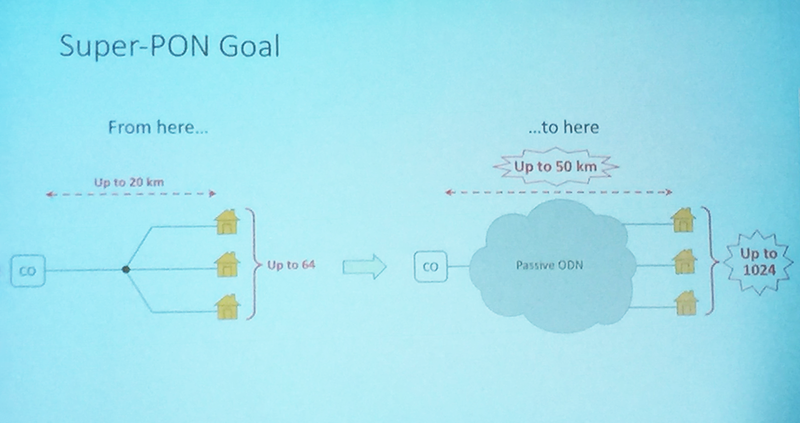 It operates over a passive ODN. Second, the Super PON targets up to 1,024 subscribers, up significantly from the maximum 64-subscriber split available on its current technology. With Super PON, DWDM is used to multiplex multiple channels over a single feeder fiber. DeSanti said few fibers would be needed to support the same number of customers, enabling the deployment of small cables (12-48 fiber cables versus 432-fiber cables). The advantage of smaller cables is that micro-trenching techniques can be used, cutting the time and cost of deployment. Repairs to a fiber cut could also be handled much faster for a 24-fiber cable (under 2 hours) versus 8-hours to repair a 432-fiber cable. 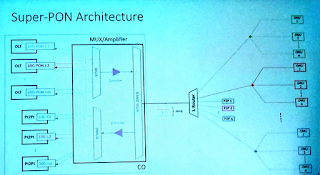 DeSanti noted that Super PON standardization began in January 2018 with a presentation at the New Ethernet Applications group of IEEE 802.3. Last month, IEEE 802.3 approved the formation of a Super PON Study Group. 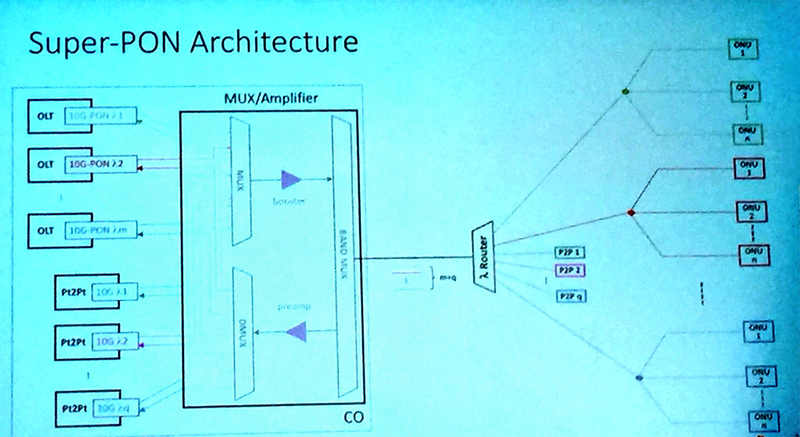 In parallel, Super PON has also been presented to both ITU-T and FSAN, possibly as an NG-PON2 extension. Google has a pre-standard implementation deployed in the field. An open question is whether Super PON economics leads Google to unpause its Access ambitions. (LOM) Report from Crehan Research Inc. 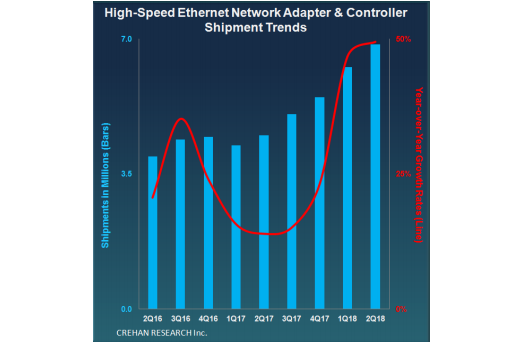 The Crehan report finds that every high-speed Ethernet technology – 10GbE, 25GbE, 40GbE, 50GbE and 100GbE – individually posted year-over-year year growth in excess of 30 percent for the second calendar quarter of 2018, and all speeds except 50GbE posted record quarterly shipments. Vendor-built 25GbE shipments almost tripled in 2Q18, approaching a three-million port annualized run-rate. 40GbE continued to show surprisingly strong growth despite the recent arrival, and now material volumes, of 25GbE, 50GbE and 100GbE. 10GbE remains the largest high-speed Ethernet growth contributor in absolute volume, comprising over half of all the 2Q18 shipment increase. Within 10GbE, 10GBASE-T saw the strongest growth rate, with an almost 80% year-over-year increase in shipments. Intel remained the market share leader for 10GbE as well as for total high-speed Ethernet adapter and controller shipments, accounting for over 60% of total 2Q18 volumes. In network adapter and controller speeds above 10GbE, Mellanox accounted for more than 70% of ports shipped. This combined segment of 25GbE, 40GbE, 50GbE and 100GbE saw shipments more than double year-over-year in 2Q18. VMware Cloud on AWS is now available in Amazon Web Services’ (AWS) Asia-Pacific (Sydney) region. 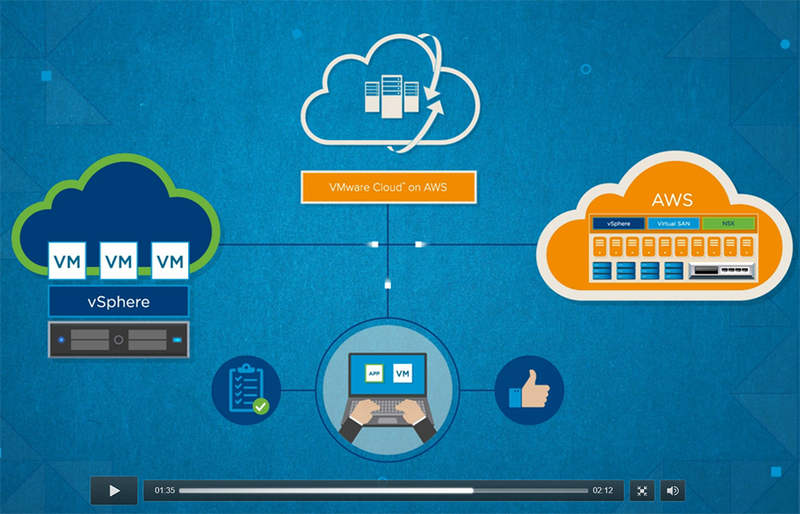 VMware Cloud on AWS is an on-demand service that reduces the cost and effort associated with migrating applications to the cloud by delivering infrastructure and operations that are consistent with those deployed within customer data centers. “Customers have been asking us to bring VMware Cloud on AWS to Asia Pacific, and we are pleased to be doing that today,” said Sandy Carter, vice president, EC2 Windows Enterprise Workloads, Amazon Web Services. Amazon Web Services and VMware announced a strategic alliance to drive hybrid cloud services for enterprise customers. Under the alliance, "VMware Cloud on AWS" will be the primary public cloud solution delivered, sold, and supported by VMware; AWS will be VMware’s primary public cloud infrastructure partner; and VMware will be AWS’s primary private cloud partner in new strategic alliance. The service, which will be sold by VMware beginning in mid-2017, will run on next-generation, elastic, bare metal AWS infrastructure. The companies said their jointly engineered "VMware Cloud on AWS" solution will enable customers to run applications across VMware vSphere-based private, public, and hybrid cloud environments. This will allow VMware customers to use their existing VMware software and tools to leverage AWS’s global footprint and breadth of services, including storage, databases, analytics, etc. 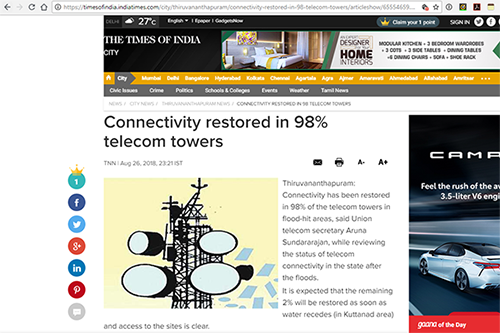 Service has been restored to almost all telecom tower following the worst flooding in the Indian state of Kerala in nearly a century. According to the Times of India, the calamity disrupted service at 22,217 base stations out of a total 85,900 base stations in the state. A full 98% have now been restored, although 400 remain on diesel backup power. 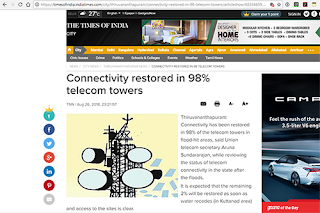 The article also notes that 190 optical fiber cables were damaged in the flood, and 168 of these have been restored. Kerala received heavy monsoon rains this year. On August 8th, with dams filled to capacity, a further 310 mm (12 in) of rainfall. As a result, 35 of the state's 42 dams were opened or overflowed, resulting in widespread flooding. Over the past year, Comcast connected more than two million people to its Internet Essentials program, which provides broadband access for low-income families. The program now serves more than six million low-income Americans, making it the largest such program in the country. Comcast also announced it will significantly expand eligibility – for the eleventh time in seven years – to low-income veterans, nearly one million of whom live within the Comcast footprint. According to the United States Census Bureau’s 2016 American Community Survey, about a third of low-income veterans do not have Internet service at home, and only about 60 percent own a computer.